Do people really need that much food? I saw a couple in the queue, she was guarding a huge shopping cart full of things up to the brim and he was disappearing among the shelves and bringing more and more jars, packets, boxes!... And one lady even lost a six pack of an expensive Perrier water from her cart on the floor because she stuffed so many items and had to balance the bottles on top of everything else. Total craziness! 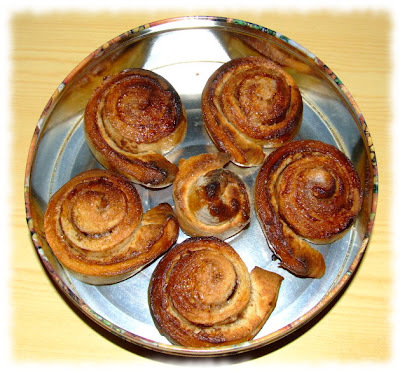 and kanelbullar - Swedish cinnamon buns (iHanna, you can be proud of me! They passed the husband test! *^v^*). But the most important thing was bigos. You may have heard about this one of the most traditional Polish dishes, probably not eaten by any other nation in the world (I think so). 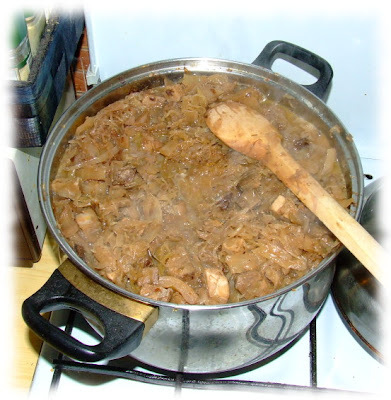 Bigos is a stew made from sauerkraut and meat, with lots of spices. I call my version Bigos 1-2-3, because I always take 1 part of sauerkraut per 1 part of sweet cabbage per 1 part of meat for it. Now comes the best part - bring it all to the boil, cook on a low heat for about 2-3 hours, then cool it off, cover and leave it overnight on a balcony (minus temperatures highly welcome!). Repeat the cooking procedure on the next day, and on the following three or four days! *^v^* On the first day all the flavors are still rather separate, but with every warming up they mix together beautifully! 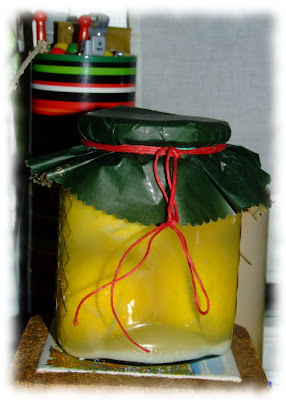 The last thing I made today was a jar of pickled lemons. They can be used in Moroccan meat dishes or oriental salads with grilled red peppers, olives and olive oil, and they are very easy to make. For this jar I took 4 lemons to be put inside and 4 lemons for the juice (8 in total). I cleaned each lemon with hot water (of course I left the skin on), then I cut it with a sharp knife as if I wanted to make four quarters but I didn't cut through the top and bottom of the lemon - they stayed whole this way. Next, I put a lot of salt into each cut (about a tablespoon of salt per lemon) and tucked each lemon tightly into the jar (this one took four lemons). To finish it off I covered the lemons with fresh lemon juice - they must all stay under the liquid. yes, I'm very proud of you. 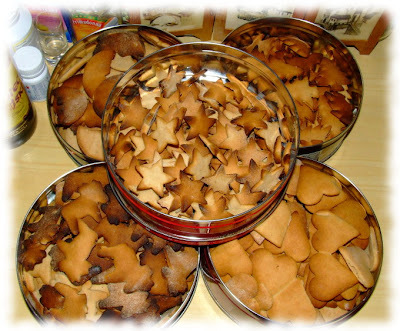 next time you are making them I'm going to send some pearl sugar over if you can't find that where you are?! Mmm yummy you have been busy!!! i got your card yesterday thank you so much!!!! it was a wonderful surprise and a beautiful card! I made some bigos last week, it lasted to eat for a whole week, and as you say got better each time I reheated it. Unfortuntaely it is now too hot here to make bigos. Christmas predictionis for over 100C temps, and I have to make pierogi in that heat and ...barszcz! wish me luck!! I dont use prunes in mybigos, does it make the flavour bettter?